All dogs need some basic dog grooming. 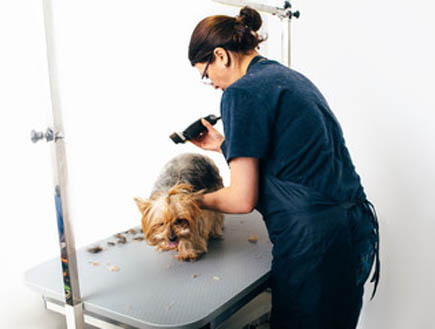 Many breeds need to be professionally groomed from time to time to keep them healthy and to keep them looking great. But there are several things you can do between visits to make your dog easier to groom and to keep it healthy. Start at the paws and work your way up parting the fur as you go. Use a brush and a comb to ensure that you remove any possible matting and tangles. If brushing is done on a weekly basis it should help prevent major matting so “Poochie” doesn’t come back from the Groomers with no hair. If you have a large breed dog you could do one body part a day and that way the whole dog gets done once per week. In other words one leg on Monday, another leg on Tuesday, the head and chest on Wednesday and so on. Ear cleaning is easy when done frequently. Use only a trusted brand of ear cleaner that is made for animals. You can be purchased it from your vet. You can also get it from a pet supply store. Apply a generous amount in the ear canal. Allow it to coat the inside well. When done let your dog shake it’s head. Then gently wipe the ear out with damp cloth. We advise that you do this outside when possible. It minimizes the mess in your house. To properly brush your dog’s teeth you need a soft bristled tooth brush and some doggy tooth paste. You can get both of these items at your local pet supply store or from your Veterinarian. Gently pull your dog’s lips up slightly and brush teeth in the back, front, top and bottom. Your dog may resist at first, so you may have to just use your finger at first to get it used to having something in its mouth. Clean ups are very easy for short haired dogs. You can just use a damp cloth and wipe dog down till it is clean. For longer haired dogs, this can be a bit more of a job. If they get really muddy they will need to be rinsed off in the bathtub. You can use either a handheld shower or a cup or bucket. Be sure to dry the dog completely and be sure to brush and comb the dog. A wet dog matts very easily. A lot of dogs have problems with runny (seepy) eyes. To help with the matting and protein buildup that comes along with it, all you need to do is take a warm wet wash cloth and wipe the gunk out every day. Ok kids, at home this would be a good job for you, (parents would need to buy a massager) While cuddling your dog, take the massager and rub your dog’s entire body, legs, feet, tail, back, head and face. (Everywhere a groomer would clip). This will get your dog used to the noise and the feeling of the vibrations and it will make it a much easier and more enjoyable trip to the groomer.